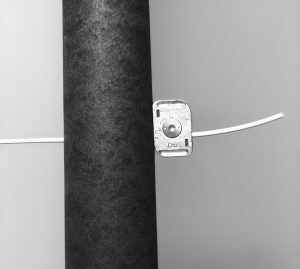 FruitLine Trellis can be attached to anchor posts with recommended knots, anchor vices, Gripples or crimps. The end posts should be properly secured to withstand the pull from the tensioned trellis lines. Proper tension is achieved by stretching the FruitLine Trellis 3% (and no more than 4%) of the row length. For example, when installing a row of 100 feet, it is proper to stretch or pull 3 feet of line (3% off 100 feet) through the end Gripple or vice. These devices will securely hold the tension in the line. Hand tensioning is possible with the 3.0mm FruitLine and in short rows with the 4.0mm FruitLine. Longer rows with the 4.0 and 5.0mm FruitLine it is recommended to use a torq tool or fence stretcher. A tractor or any similar vehicle can also be utilized for easy tensioning. GP No. 1 – Used with 3.0mm FruitLine. GP No. 2 – Used with 4.0mm FruitLine. 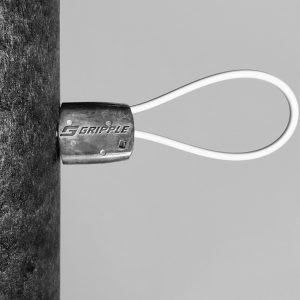 Gripple D6 – Used with 5.0mm FruitLine.